Don’t worry, I’m not going to preach about New Year’s resolutions. I’m not on a crash diet and I will never, ever give up butter or sugar. No, this salad’s more about the fact that I simply cannot bear the thought of any heavy foods for a while. It seems like all I’ve done for weeks is eat. If anyone offers me another cookie or piece of cheese, I may very well drop into a food coma that lasts until next winter. Somewhere in the mix of gorging on prime rib, attempting to empty punch bowls after my guests left (bad idea), and spending afternoons tidying edges of gingerbread and fruitcake, my body began screaming out for vegetables. I started ogling salads online and decided, just as soon as I finished the cheese ball I was working on, I was going to make this carrot and avocado salad. This recipe caught my eye on the food52 website. 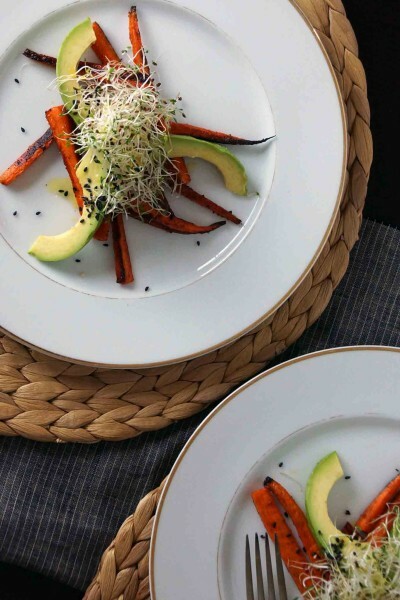 I adore roasted carrots and the thought of combining them with creamy avocado, lemon, and cumin sounded just right. I tweaked the recipe a bit, cutting out blanching the carrots and a few superfluous ingredients (because as tired as I am of over-eating, I’m even more tired of doing dishes and running to the store for the forgotten this or that), and the flavors and textures wound up being exactly what I was craving. Ready? 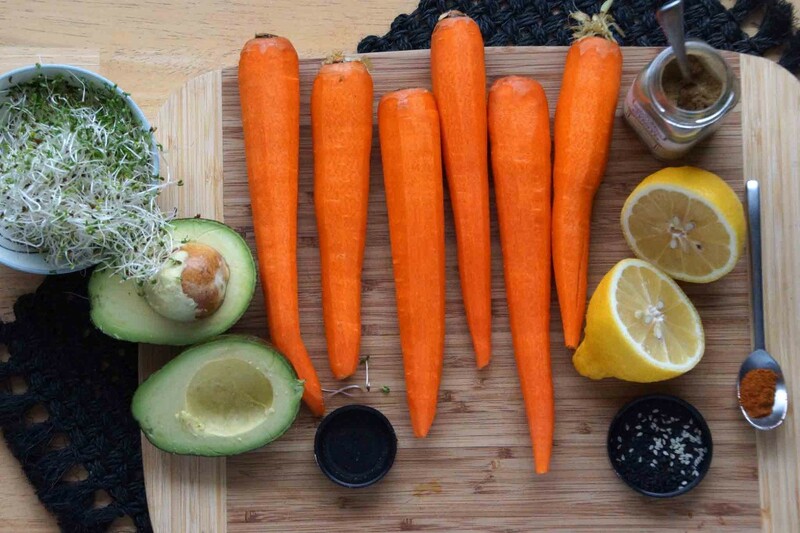 Grab a few carrots, an avocado, a lemon, some sprouts, and we’re off! Cut the carrots into sticks, toss them with a bit of cumin and red pepper. Roast the carrot sticks until they’re tender and the skinny ends start to shrivel and brown. We’re also roasting half of a lemon to use in a vinaigrette for our salad. Roasting mellows out the acidity and, as a bonus, makes the lemon very easy to juice. Squeeze the lemon and combine its juice with olive oil and a touch of red wine vinegar to make a fresh, citrusy vinaigrette. Set it aside while you compose your salad. 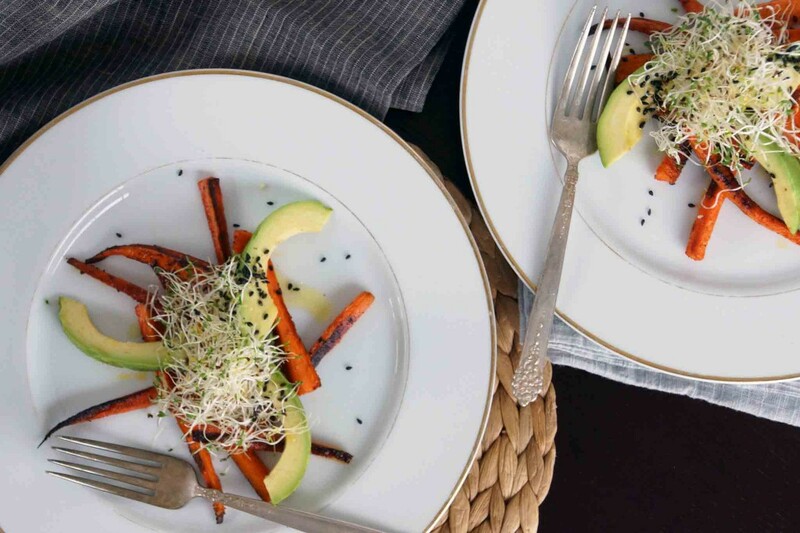 Fan avocado slices over a base of roasted carrots. Appreciate the smooth pale green against the wrinkled orange and brown. Add a handful of sprouts and drizzle everything with the vinaigrette. Finish with scattering of toasted sesame seeds and you’re all set, ready to shake loose from that holiday food coma that almost had a hold on you. If you'd like to bulk up the salad, some roasted chickpeas would be a nice addition. Toss the carrots with about 2 Tbsp. olive oil, salt to taste, cumin, and red pepper on a sheet pan. 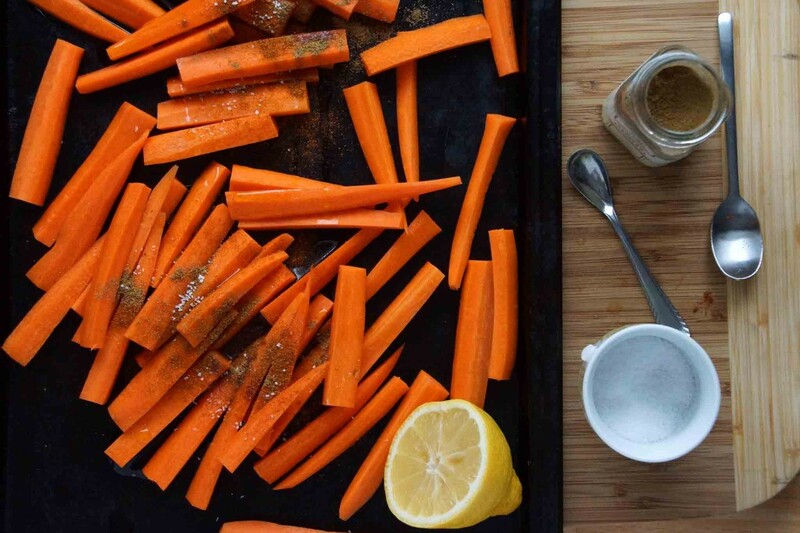 Place the lemon half on the sheet pan as well and roast until the carrots are tender and brown in spots, 20-25, flipping them over halfway through. Pour the remaining olive oil into a small jar with a tight-fitting lid. Squeeze about 1 Tbsp. of juice from the roasted lemon into the jar. Add vinegar and honey, season with salt and pepper, and shake until blended. 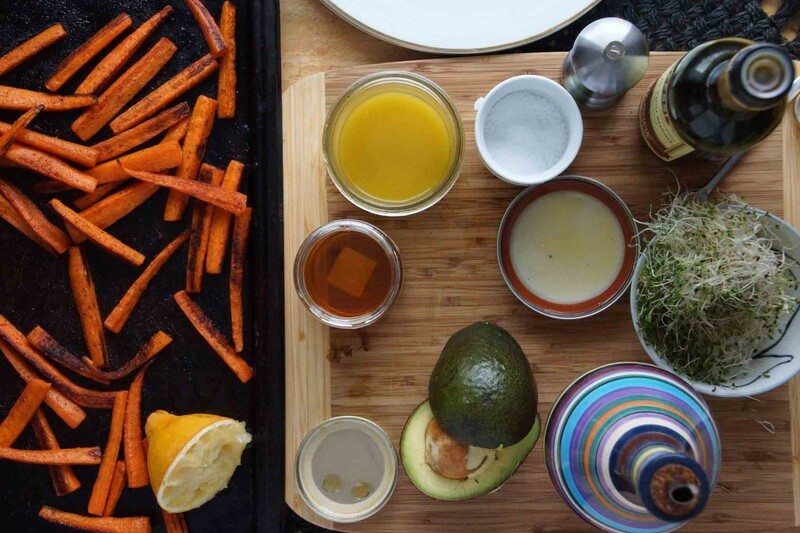 Divide the roasted carrots between plates or arrange them all on a large platter. 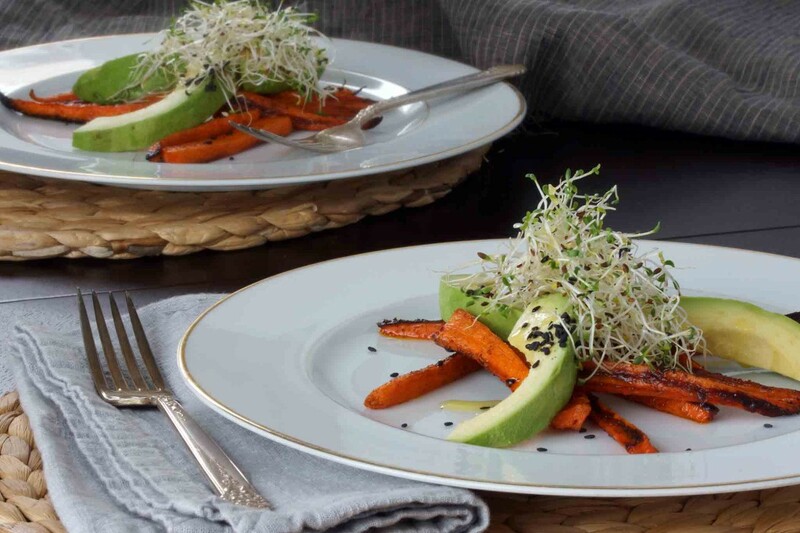 Fan the avocado wedges over the carrots, top with the sprouts, and drizzle with the vinaigrette. Scatter the sesame seeds over the top of the salad and serve. 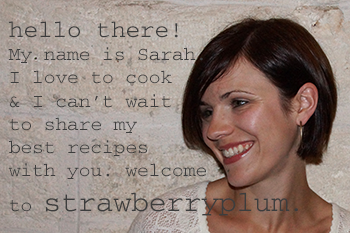 Oh Sarah, this is a gorgeous salad! I won’t ever drastically change the way I eat, but like you….I just feel like lightening up after all the party food I’ve been indulging on! I LOVE roasted carrots, but never thought to put them in a salad. This is beautiful paired with the sliced avocado. Such a beautiful and easy meal! Happy new year! Hi Anne and happy new year to you, too! Yes, this salad really hit the spot after the month-long parade of cookies and cheese plates and roasts that passed through my kitchen. I’m finally starting to feel “re-set”.